Santa Fe--Monroe Gallery of Photography, 112 Don Gaspar, is pleased to present "Remnants", an exhibition of large-scale color photographs of the environment and the environmental remnants left behind either by nature or man. In the face of increasing global attention on climate change and rebuilding; and as society grapples with the byproducts of global human achievements such as urban development and mass production that have caused problems of scarcity and waste simultaneously, "Remnants" is a timely examination of the environmental issues facing society. Photography has been Stephen’s passion since age 12, when his fascination with science led him to take photographs through a microscope. He began working on his own at age 15, attended Syracuse University’s Newhouse School of Communications, graduating in 1980. In 1982, Wilkes opened his own studio in Manhattan. Wilkes' photographs are in the permanent collection of The Library of Congress, Washington, D.C.; George Eastman House, Rochester, New York; Museum of Fine Arts, Houston; Dow Jones & Company, New York City; The Jewish Museum, New York City; and in numerous important private collections throughout the world. His work has graced the covers of numerous international publications, including Sports Illustrated, Fortune, Vanity Fair, The New York Times Magazine, Life Magazine, and Time Magazine. Selected photographs in the "Remnants" exhibition were featured in the Annenberg Center for Photography exhibit "Sink or Swim: Designing For A Sea Change", Dec 13, 2014 - May 3, 2015. © Steve Schapiro: "Stop Police Killings, Selma March, 1965"
Santa Fe--Monroe Gallery of Photography, 112 Don Gaspar, is honored to present a special panel discussion on the role of photojournalism in the civil rights movement up to the present day. Freelance photojournalist Whitney Curtis, veteran LIFE magazine reporter Richard Stolley and interim director of the UNM Art Museum and Dean of the College of Fine Arts Kymberly Pindar will share their experiences and views on Friday, September 18, starting promptly at 5:30. Seating is very limited and will be on a first come basis. The discussion will take place in the gallery during the final week of the exhibition "The Long Road: From Selma to Ferguson", which closes on September 27. Many of the now iconic photographs of the Civil Rights Movement in the United States were once front-page news. The year 2015 brought renewed attention to many of these historic images not only from the 50th anniversary of Martin Luther King's march and the acclaimed film "Selma" but also as Baltimore, Charleston, and Ferguson, Missouri, and other American cities grapple with conflicts across the racial divide and produce new images that have confronted American society anew with questions of equality. Richard Stolley already had a distinguished career in journalism when he joined TIME magazine in 1953. As a reporter for Time and LIFE he covered numerous civil rights stories during the 1960's, of which he has said "There would not have been a civil rights movement without journalism. I think LIFE magazine was the most influential publication in changing American attitudes toward race because other news magazines would tell you what was happening and LIFE magazine would show you. LIFE photographers captured images of people spitting on black kids. Those people landed in a great big photo in the magazine, their faces distorted with hate, and spit coming out of their mouths. That image is going to change peoples' attitude in a way that words never could. That is exactly what LIFE magazine did week after week after week." After graduating with a degree in photojournalism from the University of Missouri-Columbia, Whitney Curtis worked as a staff photojournalist at The Kansas City Star, northern Utah’s Standard-Examiner, and the Daily Herald in suburban Chicago. As an editorial photojournalist, Whitney’s work has been honored by The Associated Press, NPPA’s Best of Photojournalism, CPoY, and Women in Photojournalism. A resident of St. Louis, Whitney was not surprised by the outpouring of anger and emotion after a police officer killed Michael Brown in Ferguson, Mo. What she did not expect, however, was to be caught in the middle of it. She covered the 2014 protests extensively, often on assignment for The New York Times. Her image of image of Rashaad Davis from the Ferguson, Missouri protests was awarded 1st place Domestic News 2014 in NPPA's Best of Photojournalism Contest. Kymberly Pindar is the interim director of the UNM Art Museum and dean of the UNM College of Fine Arts. Pindar is co-curator of the exhibition "Necessary Force: Art of the Police State which" will run from September 11 through December 12, 2015 at the UNM art museum. This exhibition interrogates law enforcement’s longstanding history of violence, and the systemic forces that continue to sanction and promote the violation of civil rights in this country. Dr. Pinder holds two master’s degree and a Ph.D. in art history from Yale University. Monroe Gallery of Photography was founded by Sidney S. Monroe and Michelle A. Monroe. Building on more than five decades of collective experience, the gallery specializes in 20th and 21st photojournalist imagery. The gallery also represents a select group of contemporary and emerging photographers. Monroe Gallery was the recipient of the 2010 Alfred Eisenstaedt Award for Excellence in Photojournalism. Follow @Monroegallery on Twitter for a Periscope livestream of the panel on Friday, September 18. An art exhibit opens tonight in Albuquerque that’s sure to generate discussion, and possibly controversy. “Necessary Force: Art in the Police State” includes work from 31 artists, and covers such historical themes as the civil rights movement to more current events such as the James Boyd shooting here and the Ferguson, Mo., riots that started after Michael Brown was fatally shot by a police officer. Pinder, who also is dean of the UNM College of Fine Arts, and Karen Fiss, a professor at the California College of Arts, worked on pulling together the exhibit for the past year. It is in the University of New Mexico Art Museum, and will be on display until Dec. 12. The majority of the works are responding to actual events. 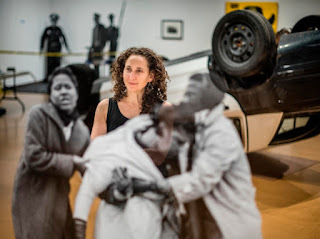 Documentary photographs from the 1960s and ’70s from the museum’s renowned collection stand alongside work by contemporary artists, which includes an installation of an overturned police car to a piece that points out items that were mistaken for guns. “The juxtaposition of historic and recent imagery helps us assess the evolution of these pressing social issues over the 50 years since the Civil Rights movement,” Pinder said. The exhibit comes after a Department of Justice investigation found that Albuquerque police used excessive force for years, and as the department tries to comply with a court order to overhaul its practices. Pinder said the curators and artists hope to encourage critical thinking and dialogue around the complex history of law enforcement and violence in the United States. The contemporary works in the exhibition address a range of issues, including surveillance, incarceration, drug abuse, inadequate mental health care, gun violence and racial profiling, as well as the power of collective protest and collective healing. It also examines the role of photography in shaping public opinion, as well as the longer-term matter of how we come to know and remember history. The goal for the exhibit falls in line with UNM’s mission to encourage critical thinking, dialogue and problem-solving around issues that are relevant today, Pinder said. Pinder always wanted to work with Fiss on a show. The pair have known each other since their graduate studies at Yale University. A thematically related exhibition, “The Long Road: From Selma to Ferguson,” is currently on display at The Monroe Gallery in Santa Fe until Sept. 27. "For decades, Steve Schapiro’s iconic photographs have been witty visual documents of American cultural and social movements"
For decades, Steve Schapiro’s iconic photographs have been witty visual documents of American cultural and social movements. He’s captured significant moments like Robert Kennedy’s presidential campaign and Martin Luther King, Jr.’s march to Selma as well as intimate portraits of Hollywood celebrities such as Marlon Brando in The Godfather and Robert De Niro in Taxi Driver. Steve Schapiro's iconic photographs are included in the exhibition "The Long Road: From Selma to Ferguson" at Monroe Gallery of Photography, Santa Fe, through September 27. The Eddie Adams Workshop is an intense, tuition-free photography workshop open annually to 100 students from around the world, led by the industry's top professionals who volunteer their time for the 4-day experience. Eddie Adams, the founder and namesake, created this first and only tuition-free photo workshop in 1988. Since then, through the help of corporate sponsorship and private donations, Eddie, his wife, Alyssa, and their friends have created a space for mentorship, motivation, and an irreplaceable family of photographers. We would like to thank our community for its assistance through donations and spreading the word to others for their support of our workshop. We would also like to thank our partners who continue to sponsor the workshop, including our main sponsor Nikon, to help keep Eddie’s vision alive and strong. At the workshop, each student is part of a 10-person team that is sent out on assignment. In addition to working on and completing their assignment in four days' time, students attend portfolio reviews and discussions with world renowned photographers and editors such as James Damon Winter, Preston Gannaway, John Moore, Vincent Laforet, Andrees Latif, Rodrigo And, Nancy Andrews, James Balog, Al Bello, Jodi Cobb, Erika Larsen, Elizabeth Krist, Ami Vitale, Carolyn Cole, David Guttenfelder, Todd Heisler, Tyler Hicks, Lynn Johnson, David Hume Kennerly, Santiago Lyon, James Nachtwey, Eugene Richards, Stephanie Sinclair, John H White, Dan Winters, MaryAnne Golon, Jamie Wellford, Michele McNally, Gordon Parks, Alfred Eisenstaedt, Joe Rosenthal, Cornell Capa, Mary Ellen Mark, Chris Hondros, Platon, Bill Eppridge, Maggie Steber, Nick Ut and many more.